One imagines that there must be another “Department of Defense Dictionary,” kept under lock-and-key in the Pentagon, that dispenses with the bland language and penchant for deceptive euphemisms. That dictionary would define an AOR as “a vast expanse within which the United States seeks to impose order without exercising sovereignty.” An AOR combines aspects of colony, protectorate and contested imperial frontier. In that sense, the term represents the latest incarnation of the informal empire that American elites have pursued in various forms ever since U.S. forces “liberated” Cuba in 1898. The idea that the US might Build a pipeline through Arlington or use a drone strike in Central Park brings home to the colonial nature of these devices. 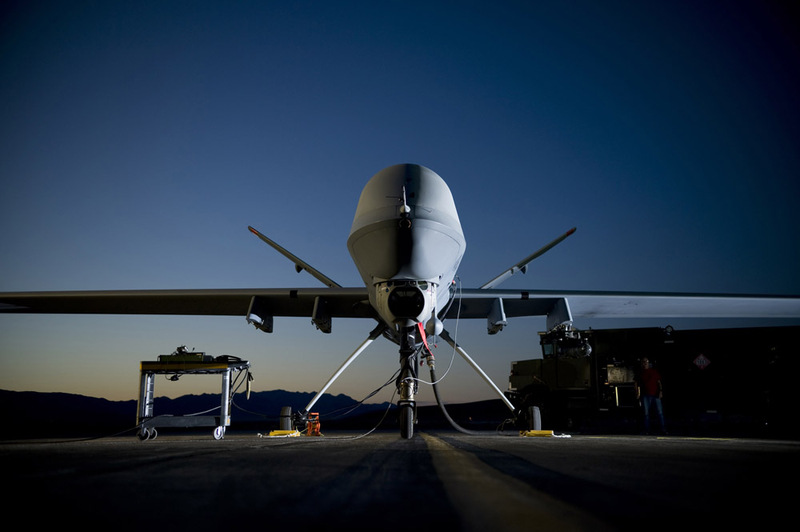 The retirement of the antiquated Predator drone MQ-1, which is to be withdrawn from service in July and replaced by the more capable MQ-9 Reaper, is giving military analysts an opportunity to review the mixed history of a weapon that has long been associated with low-cost war, a sense of disembodiment from conflict, and for inflicting a high number of civilian casualties. As we have often heard that one solution to problems in the middle East hinge on Israel and the West’s relationship with its genocidal policies with the Wet Bank and Gaza. Banksey, stree artist and activist has long been painting his brilliant antiwar comments on that wall. 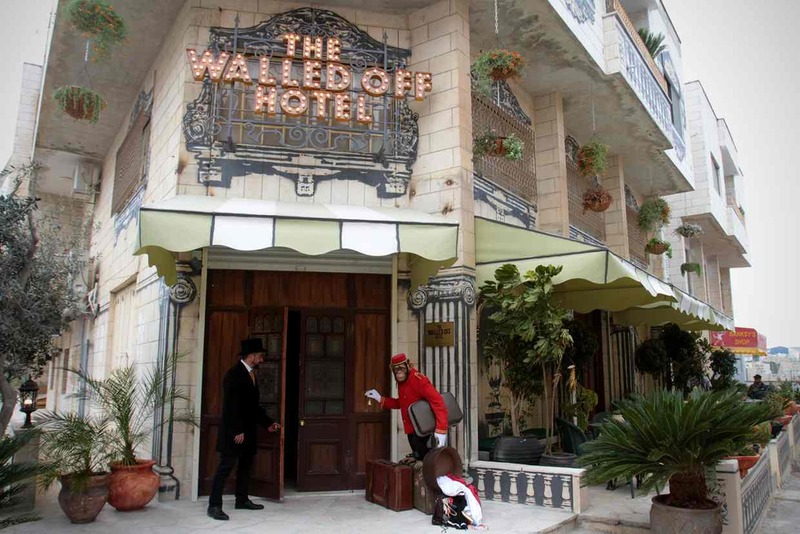 Now her has ramped up his stand by opening a hotel/musem right accross the street from the wall where it divides Bethlehem. What actually happened on the frozen banks of the Missouri River? A fascinating inside look at the Standing Rock veterans appearance. Like everything in real life it was messy. I think VFP should look at what was done as a possible model as we go forward into the darkness looming before us. He intervened with two comrades to halt the massacre of unarmed Vietnamese civilians by United States soldiers in 1968. Here is my story of Thompson and Colburn written back in 2008 during the Winter Soldier II proceedings. “Support Our Troops,” “Freedom fighters,” “Heros,” “Patriots.” Sound familiar? We have heard these words and phrases often over the last few years. Some people see such language as patriotic; others see it as jingoism and xenophobia. In Winter Soldier II, many soldiers from Iraq and Afghanistan discussed acts and policies that, at first hearing, sound decidedly unheroic and unpatriotic. I am sure that some will call these soldiers “traitors” and others will call them “heroes”. Our first real American hero received death threats and was reviled by many when he came home from his tour in Vietnam. He was attacked and threatened by many including fellow soldiers and a member of congress. Sounds like he must have committed some kind of atrocity, right? Read on and you will learn the story of Hugh Thompson, helicopter pilot, and of his crew. watched from the air as an American captain walked up to one of the wounded they had just marked for rescue. He took out his gun and “blew her away”. Charlie Company shot every wounded villager they had marked for rescue. Thompson coaxed the civilians out of the bunker, keeping his body between them and Lt. Brooks, and brought them over to his helicopter. He then got on the radio with the gunship that was piloted by his buddy and asked them to shuttle the civilians to safety. It was unheard of to use a gunship for Medivac but they did it that day twice to get all the Vietnamese to safety behind the lines. On their way out of the village, they again saw movement among the bodies in the ditch. They landed and Glenn, the crew chief brought a small child out of the ditch and handed him up to Colburn who said, “The child sat on my lap, limp. He had that blank thousand-yard stare. I couldn’t even make him blink. He was in severe shock. He had no broken bones, no bullet holes, but he was completely drenched in blood. When Glenn picked him up, he was still clinging to his dead mother.” They delivered the child to Quang Ngai hospital, an orphanage. They assumed at the time that he was only 4 or 5, but when they met him again in 2001 they found he had been 8 years old and, after staying at the hospital for 2 days, he left and went back to the village, 10 miles through the jungle, to make sure his parents were properly buried. Thompson briefed his commanding officers on his experiences and heard no more from them until Seymour Hersh broke the story of My Lai two years later. At that point Thompson testified to the Senate, the Department of Defense and for all the court-martials. Back in Vietnam shortly after My Lai, reports of murder and mistreatment of Vietnamese civilians passed across the desk of an Army Major in Thompson’s unit named Colin Powell. His investigation of these charges, reported that “relations between American soldiers and the Vietnamese people are excellent.” Powell went on to high public office and more cover-ups in Iran Contra and the lead up to the war in Iraq. 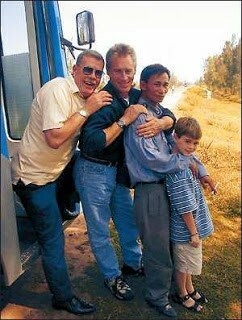 The photo shows Thompson, Colburn, Do Hoa, the boy they rescued from the ditch and Colburn’s son Conner during a visit to Vietnam in 2001. 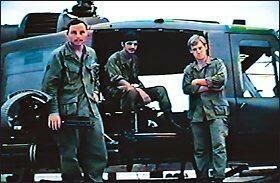 After My Lai Hugh Thompson flew the remainder of his Vietnam tour as a scout without gunship cover. He was hit by enemy fire eight times and shot down four times. The last crash left him with a back injury that ended his duty in Vietnam. After recovering he trained helicopter pilots in the States. He eventually received a commission and retired from the military in 1983. 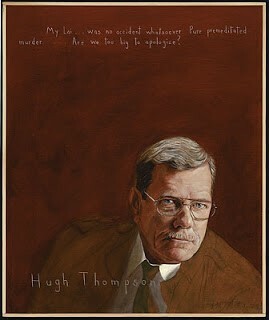 Thompson waited through 30 years of abuse from fellow soldiers and the public for recognition for his courageous stand. In 1998 He accepted the Soldier’s Medal with tears in his eyes “for all the men who served their country with honor on the battlefields of South-East Asia.” Professor David Egan at Clemson University, who had served a French village during World War II where Nazi troops killed hundreds of civilians, led the campaign to get Thompson recognition. Thompson, who died of cancer in 2006, lectured on battlefield ethics at West Point and other military academies during the last years of his life. He and His crew’s actions became an example used in military manuals in both the US and Europe. West Point Dean Col. Tom Kolditz described his impact: “There are so many people today walking around alive because of him, not only in Vietnam, but people who kept their units under control under other circumstances because they had heard his story. We may never know just how many lives he saved.” When asked what he told the Military Officer Cadets, Thompson said he just told them to “Be a soldier”. So, Thompson is a real American hero in many people’s eyes. But, what about the men in Charlie Company? What does this story make of them? Certainly, their immediate leadership appeared weak and even encouraged the atrocities that occurred. We know little of the actions of the senior officers. Evidence against them during the court-martial of their subordinates was contradictory or missing. Perhaps it too got lost on the desk of Major Colin Powell. So who are the heroes now? And who are the traitors? Veterans For Peace stands in solidarity with the historic resistance at the Camp of the Sacred Stones in North Dakota. We join our Indigenous sisters and brothers in opposing the construction of an oil pipeline by the Dakota Access company that threatens drinking water and sacred burial grounds. We acknowledge that the courageous stand of the Standing Rock Sioux Tribe and many allied tribes is being carried out by caretakers of the earth who are protecting and defending their ancestral lands and the water that runs through it for current and future generations. The continued assault against the sacred land and water as well as the destruction and desecration of sacred sites is an atrocity and must be stopped. The United States must honor its treaties and recognize Indigenous rights. We strongly condemn the violence being used against the resistance and believe it to be both a crime and a human rights abuse. We consider the violation of Indigenous lands, culture and tradition to be another example of specific geographic regions — those typically home to vulnerable and marginalized populations — being deemed exploitable and expendable by our government and certain corporations. These are areas that VFP advisory board member and investigative journalist Chris Hedges has referred to as “sacrifice zones.” As veterans, we see the connections between greed, racism, violence and environmental destruction in our own communities, and war and militarism abroad. We strive to achieve “Peace at Home and Peace Abroad” as a lens through which we view our mission. We believe the Standing Rock action is consistent with our philosophy and approach to help build a more just, peaceful and sustainable world. We understand that different nonviolent struggles for social and ecological justice are linked by the common thread of resistance to subjugation and oppression. As Veterans For Peace we are committed to acting nonviolently and many of our members are trained and experienced in nonviolent resistance. We have responded to the Standing Rock Sioux call for international observers by facilitating the presence of VFP members at the Camp of the Sacred Stones. Four Arrows (Wahinkpe Topa), aka Don Trent Jacobs, an American Indian scholar and activist and co-founder of the Northern Arizona chapter of Veterans For Peace, has this to say regarding the Standing Rock resistance: “The last healthy land masses on our planet are not coincidentally those occupied by Indigenous Peoples. That they are on the front lines in standing against oil and mining operations threatening to destroy waterways should not be surprising. The Indigenous worldview, one that guided humans to live in relative ecological harmony, sees this place as sacred…At this crossing point in American history, at the threshold of a mass extinction, the Standing Rock protest is much more than symbolic and deserves all the support VFP can give it.” For more information on how you can support this profound and historic struggle, go to: http://sacredstonecamp.org/.